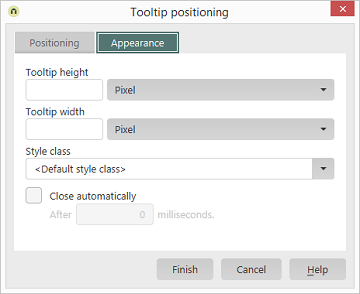 The height and width of the tooltip can be defined in pixels or as a percentage based on the window height/width. Here, one of the style classes defined for tooltips in the Design module can be selected. By selecting "Default style class", the default style class for tooltips will be used. The tooltip will be closed automatically after the specified time. The length of time is specified in milliseconds here.